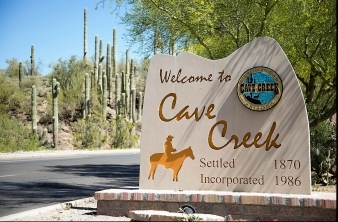 The Town of Cave Creek is located in northern Maricopa County and is bounded by Maricopa County to the north, Phoenix to the west and south, Carefree to the east and Scottsdale to the southeast. The Town encompasses approximately 31 square miles and was incorporated in 1986. The Town is well situated for access to regional transportation. Interstate 17 (I-17) is approximately 8 miles to the west, via the famous Carefree Highway. I-17 connects Phoenix and Flagstaff. The 101 Loop is 12 miles to the south and provides connections to the East Valley. Air transportation is available at Scottsdale Municipal Airport, Deer Valley Airport and Sky Harbor International Airport. Recreation opportunities are available at nearby Lake Pleasant, Bartlett Lake, as well as the Spur Cross Ranch Conservation Area, Cave Creek Recreation Area, and Gateway Desert Awareness Park. The 2010 population of Cave Creek was 4,823 – a 33% increase since the 2010 census of 3,728 persons. That was a faster rise than the decade before, where it rose 27.5%. Today, Cave Creek is both a modern town with all the amenities one would expect, as well as a glimpse back into the days of the Wild West. It has something for everyone, and still attracts visitors and “settlers” from all over the world. Please also see "Notice to Prospective Property Owners"